We at DOORSTEP DETAILS, pride ourselves on enhancing the lives of residents, while improving the bottom line for property management and developer ownership. 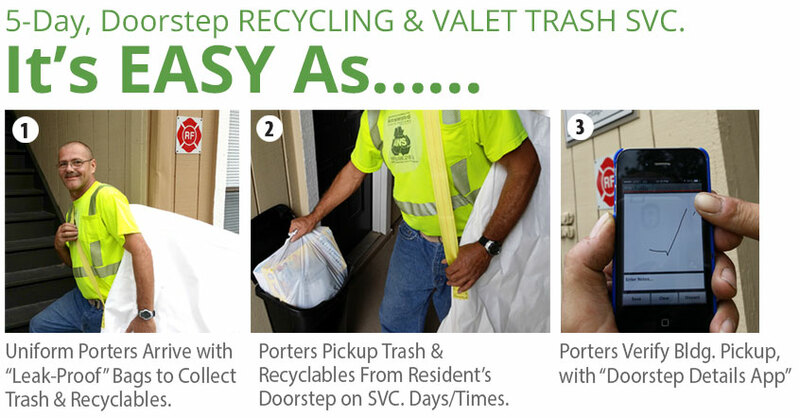 DOORSTEP DETAILS-Valet Trash is a National Leader in Affordable, 5-Day-A-Week, Apartment/Condo Doorstep Trash Pickup. Our specially-trained, Uniformed, Licensed & Insured Valet Trash Porters, service THOUSANDS of apartment residents across the U.S., nightly. Our quality-driven services are reinforced by the latest advancements in technology, and supported by the award winning AWS Management Team! Enact the #1 Retention Tool in Multi-Family. Contact us for FREE Valet Trash Quote Today, CALL 866.698.2874. or Please Fill Out the Valet Trash Quote Form. How does the Doorstep Details-Valet Trash System Work? It’s Simple. Our proven system starts by delivering a sleek, new 13-Gallon Container to each Unit in the Community. Residents are then allowed to place their Bagged-Trash Inside the Container, and place the Container outside their doorstep for trash retrieval on the industry standard schedule of 6p.m.-8p.m., Sun.-Thurs. Doorstep Details-Valet Trash Porters, remove the bagged-trash from each unit with our “leak-proof” satchels, starting pickup at 8p.m. DD-Valet Trash Porters, then dispose of the trash in the community’s onsite dumpsters/compactor. We also clean the area around the dumpsters/compactor, and conclude service by sending Property Management a Daily “Doorstep Details Report” or “DD Report” for short. DD Reports are easy to understand, pdf documents that report GPS-Date/Time-Stamped Arrival & Departure Times, Bldg. Pickup Confirmation, & After-Service Photos of Bldgs. You now know, when your Valet Trash Porter Arrived Onsite, what they were doing onsite, & when they left the community. Powerful insight and “peace of mind” for you, your residents, & ownership. Discover More about our Doorstep Details Reporting Technology. RELIABILITY & CONVENIENCE: We’re proud of our advancements, but it’s not all about the Tech. It’s about Your Residents! The convenience and reliability we offer your residents is life changing for most. Your residents No longer have to take unsafe nightly trips to compactor/dumpster, or place stinky trash inside or on top of their vehicle to throw it away. RESIDENT FOCUSED: To help introduce this value to your residents, all of our newly contracted communities receive a FREE RESIDENT APPRECIATION DAY! Our R.A.D. Event consist of FREE Food & Drinks, FREE Giveaways, & Svc. Info. for Residents, hosted by an AWS Team member. Please visit our Resident Information Page, to learn more about our resident-focused services. INCREASED PROFITS & PEACE OF MIND: Take confidence, we offer our quality services with the Affordable Phase-In Rates & a Price-Match Guarantee, that allows our Mgmt. Groups to MAXIMIZE & INCREASE their Net Operating Income Per Unit! AWS is also “A-Rated” by the Better Business Bureau, and a Compliance Depot Certified Vendor (Compliance Depot #: 535542). In addition, DOORSTEP DETAILS-Valet Trash is a preferred vendor for numerous Management Groups and Waste Savings Consultants across the U.S. We ask that you explore Our Clients page, to better understand the companies benefiting from our savings and service. Ready to discover your communities’ potential? Please Fill Out the Valet Trash Quote Form for a FREE Detailed Bid, specially priced for your community. We offer New Construction & Vendor-Switching Discounts. In addition to, Phase-In Pricing Programs with Flexible Contracts that don’t lock you into bad service. Discover the AWS Difference and Call Us Today, 866-698-2874! According to a recent national study, “full service trash removal is one of the most requested luxuries residents want in their apartment community”. Not only does full service trash removal expand your amenity package, it also differentiates your property and gives you a competitive edge. 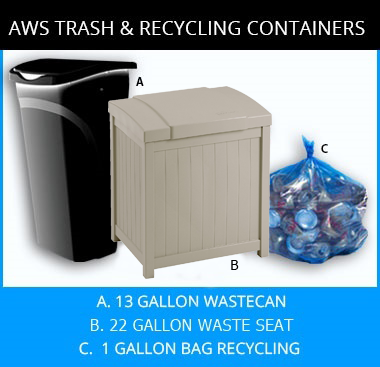 Best of all, AWS Valet Trash Services provides you with a supplemental income stream along with reducing your net operating expense! 59% of renters say they search for communities that offer on-site recycling. Residents are ready to participate! AWS Valet Trash Services makes “taking out the trash” hassle free! You will now have the ease of simply dropping their trash and recyclables into a receptacle right outside your door. You no longer have the inconvenience of walking to a far away dumpster/compactor or the struggle of carrying heavy loads of garbage down long flights of stairs. What was once a chore is now your #1 amenity! Safety – No more late night trips through the parking lot . Stop bag leakage on or in your car!